Here’s another “no way you can eat just one” Sconza Candy! Sconza’s gourmet Dark Chocolate Raisins rocked our world and their Dark Chocolate Espresso Beans are just some kind of wonderful. 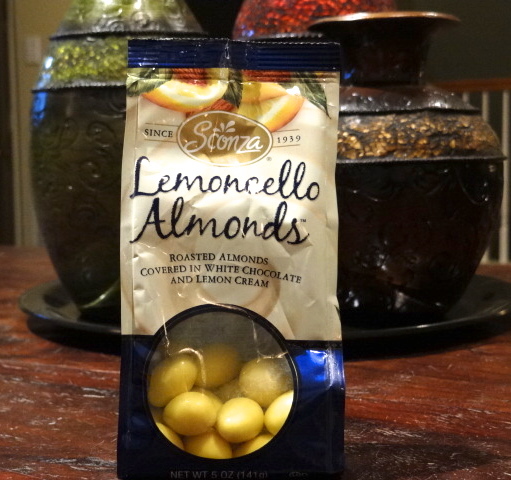 Lemoncello Almonds have been on my list to try for a couple of months now, and having tasted them, I’m sorry I waited so long. Almonds are my second favorite nut, after pecans; white chocolate is my second favorite chocolate, behind dark chocolate; and lemon is my second favorite citrus flavor, just a smidge lower than orange. This candy is no second fiddle, though. Toasted almonds are swathed in sweet, creamy white chocolate, then covered with a delicate lemon-flavored candy shell. Yum! Not only are Lemoncello Almonds tasty, they are also very pretty! With their bright lemon shells, they would be perfect for spring luncheons, bridal or baby showers, or Easter celebrations. The third generation of Sconza candy-makers created these treats to celebrate the 50th anniversary of their parents, so they would be right at home at your special occasions. Don’t wait for a party to enjoy them, though! The Sconza Family’s promise to craft only the highest quality candies has been fulfilled in every flavor we have tried. P.S. to the Sconza Family – What do you think about a candy made with my absolute favorite flavors: Dark Chocolate Orange Pecans? I’m available for taste-testing!